In-field angular pinning performances at different temperatures have been analysed on chemical solution deposited (CSD) YBa2Cu3O7−x (YBCO) pristine films and nanocomposites. We show that with this analysis we are able to quantify the vortex pinning strength and energies, associated with different kinds of natural and artificial pinning defects, acting as efficient pinning centres at different regions of the H–T phase diagram. A good quantification of the variety of pinning defects active at different temperatures and magnetic fields provides a unique tool to design the best vortex pinning landscape under different operating conditions. We have found that by artificially introducing a unique defect in the YBCO matrix, the stacking faults, we are able to modify three different contributions to vortex pinning (isotropic-strong, anisotropic-strong, and isotropic-weak). 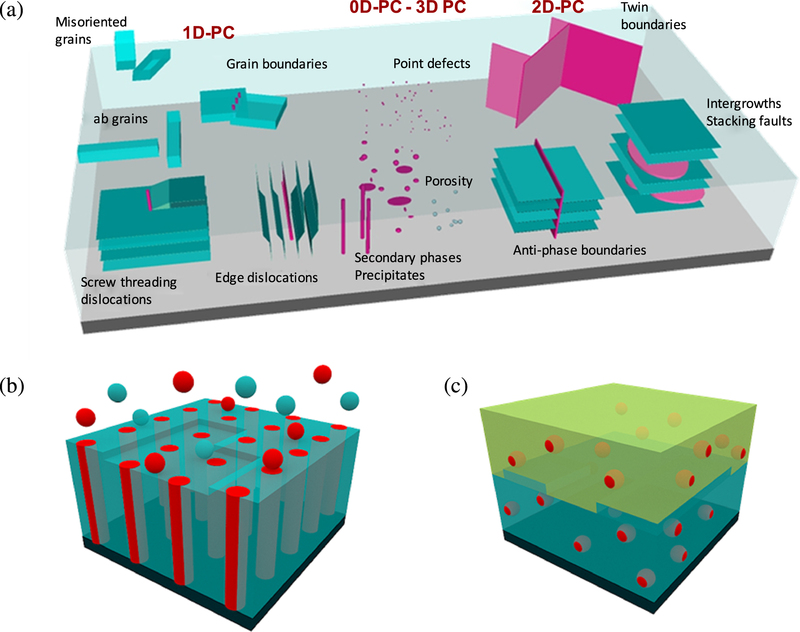 The isotropic-strong contribution, widely studied in CSD YBCO nanocomposites, is associated with nanostrained regions induced at the partial dislocations surrounding the stacking faults. Moreover, the stacking fault itself acts as a planar defect which provides a very effective anisotropic-strong pinning at H//ab. Finally, the large presence of Cu–O cluster vacancies found in the stacking faults have been revealed as a source of isotropic-weak pinning sites, very active at low temperatures and high fields.